Dry goods rack included Dimensions: Length: 30 1/2" Width: 19" Height: 19 3/4" - 33 pounds •One piece roto-molded UV polyethylene construction is extremely durable. •Constructed of food grade material that is dry ice compatible. •3 inches of insulation in the lid and 2 inches in the walls provides superior insulation. •Freezer style sealing gasket locks out the heat. •T-latch keepers are molded into the cooler body. 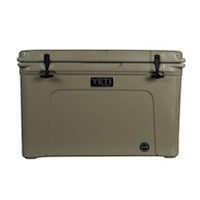 •Padlock holes are molded into the cooler body and lid. •Full-length, self-stopping hinge can't hyper extend and break. •Non-slip, non-marking rubber feet help keep the cooler where you put it. •Replaceable nylon rope and textured grip handles make carrying easier. •Drain plug and rubber washer guarantees leak-proof reliability. •Tie-down points are molded into the cooler body for solid mounting.